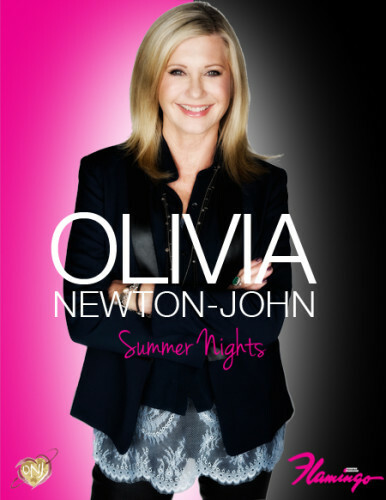 Olivia Newton-John’s first Las Vegas residency, inside the Donny & Marie Showroom at Caesar Entertainment’s Flamingo Hotel and Casino, is an intimate, poignant show she calls “Summer Nights”. The 20-plus song production premiered this week. I’ve met and written about Olivia over the years at various stages of her extraordinary career and, in Vegas for a conference, I wanted to see her new show before the grand opening. The iconic star emerged looking and sounding fabulous. Stepping out in black and white, framed by the venue’s familiar pink, her understated stage presence is as relaxed, seasoned and elegant as the themes of her earliest hit records. After decades of recording, filming and touring, Olivia is a masterful artist, who, like Doris Day, never really gets the serious credit she deserves. With a refreshing emphasis on music, Olivia sang her most popular and audience-friendly songs and a few cover tunes. Her 45-date engagement runs through August. In perfect tune on every song from “Physical” to “Have You Never Been Mellow”, Olivia clearly takes care of herself. Her voice, which still expresses her unique blend of struggle, strength and sweetness, achieves clarity in every song and clarity defines her superior vocal style. She moves with ease in simple, playful choreography that wisely lets the spotlight stay centered on the 65-year-old pop star. The skilled eight-piece band and spot-on backup singers play against a black and white stage design, which complements ONJ’s pronounced style. She kept banter light and humorous. Xanadu soundtrack songs include the hits “Magic” and “Suddenly” and the show features luminous images from the 1980 picture, from movie publicity stills to clips of her film character, Kira, dancing with co-star Gene Kelly. “Summer Nights” includes themed segments for Grease (1978) songs (“We Go Together”, “Look at Me, I’m Sandra Dee (reprise)”, “Hopelessly Devoted to You”, “Summer Nights” and “You’re the One That I Want”) and a medley of Olivia’s early country recordings and hits, including “Country Roads”, “If You Love Me Let Me Know”, “Please Mr. Please” and “Let Me Be There”. The show’s title number, the boy-girl, tell-me-more ensemble duet from Grease, is a crowd pleaser. When the audience added its own pathetic attempt at the heavy sigh that was originally John Travolta‘s oh at the climax of the story in song, Olivia hilariously broke character and turned to the audience in mock horror, a brief moment of self-awareness which made the finale all the more satisfying for everyone in the room. “Summer Nights” employs a jovial, even raucous, sense of life. It’s hard not to have a blast when she’s singing about “good, Kentucky whiskey”, getting animal and places where nobody dared to go. Though this longtime fan missed hearing Olivia perform songs from Two of a Kind, Back with a Heart, Soul Kiss, Grace and Gratitude and The Rumour, the show is a musical journey from “I Honestly Love You” (1974) to ONJ’s Brazilian-influenced Gaia anthem “Not Gonna Give Into It” (1994) and more, so it is understandable why certain songs didn’t make the final set list. Whatever one’s favorite moment or song from the remarkable career of Olivia Newton-John, some of the most powerful performances in “Summer Nights” are her covers of “Cry Me a River”, “Over the Rainbow” and the stirring rendition of Stephen Sondheim’s layered “Send in the Clowns” from the 1973 musical A Little Night Music. The mystery of what moves us in music is of course enormously complicated, so each member of the audience will be touched in some unique way by Olivia’s incredible range in theme, technique and life experience. But you will never think of Olivia as a mere pleasant voice or source for fun pop diversion from the past again. Here, she delivers a rewarding sample of why she is the best. The impeccable performance – expect stark staging, not glitz ala Cher or Celine Dion – stems from ONJ’s status as a true pop music diva who has earned every dollar; she was an opening act for Charlie Rich at the Las Vegas Hilton in the summer of 1974, worked with Don Rickles, Eddie Rabbit and other Vegas acts, so Olivia knows the boulevard’s demands and strikes the proper tone for a show that combines glamor and ability. Her 40th year return to performing in Las Vegas, this time in headline residency, is a triumph. The fact that Olivia recently lost her sister, Rona, to cancer, makes the charitable part of this production especially meaningful. In 1992, Olivia was diagnosed with breast cancer. Her personal thriving led her to create a partnership with the Austin Health and the creation of the Olivia Newton-John Cancer and Wellness Centre (ONJCWC) in her hometown of Melbourne, Australia. Olivia donates a portion of the $68-$249 ticket price to the ONJCWC, which provides comprehensive services for cancer treatment, education, training and research as well as a dedicated wellness center.